Their values, motivations, behaviours and subsequent “culture fit” to the organisation are profiled ‘frictionlessly’ using their social “footprint”. One theme that continues to feature heavily in the resourcing discussion is the “Candidate Experience”. It was a key theme at the recent HR Technology conference in Las Vegas and HR Tech conference in Amsterdam The Candidate Experience awards have even made it to Europe. Oh really?! One look at the online experience alone shows just how far we are away from that right now. Lets face it, if the online customer experience was anything remotely like the online candidate experience most organisations would be out of business in a fortnight. In an attempt to distance the candidate from the hideous interface presented by the average enterprise applicant tracking system, some companies are investing heavily in their career site, building in new, interactive multimedia features in order to create an overall more engaging and superior user experience. On the face of it this sounds promising – replace turgid job ads with realistic job previews, replace boring statements from the corporate brochure with cool video’s from “real” employees. Add in new features like “Other people who viewed this job, also viewed these other jobs.” And the ability to ‘personalise’ their career experience by picking and choosing career information by ‘channel’. I met with several vendors at both conferences who offered solutions in this category and they all pitched their wares around this story of “personalisation” of content. However, I don’t think their definition of personalisation goes far enough. Personalisation, in my view, needs to go to the next level and in order to do that, we need to start taking into account an essential missing element – Personality. It may be a great idea to upgrade the career site experience and include lots of images, video and personalised channels, but what if I don’t actually want to see that? What if that’s not how I process data and information? What if I’m largely high on Introversion, do I really want to be bombarded with rich media from all angles? Or what if I’m high on Detail? Do funky, smiley video’s and job summary’s give me what I need to decide if this is the organisation for me? Sometimes less is most definitely more. What I do know is that when we talk about personalisation, even in the consumer space, we largely mean around content type, activity or habit. Few, if any, are personalising the “experience” to cater for the values, motivations and behaviour profile of the visitor. The scenario I paint at the beginning of this post is there for a reason – it’s possible now, you just don’t know it yet. We are entering an era where technology and our understanding of the brain is delivering tremendous insight which in turn we can use to create a much richer overall experience for the potential hire. This may seem like fantasy, but its real. Whilst it’s good to see that we are moving on, and we are at least thinking creatively, we are not going far enough. The opportunity exists to create a truly personalised experience yet we are still stuck in a “one size fits all” approach. 18/11/2014 in Big Data, Data Science, Engagement, Recruitment, Social Media, Talent, Technology. The cynic in me responds: one size fits all would be a huge improvement over the currently ubiquitous one size fits none… Why try to do cartwheels before you can crawl. Adding technology to a bad process generally results in an expensive and slick bad process. That said, I do wonder about whether or not I’d like personalization and to what extent it would help or hinder me. Every gain in my life has come from giving up what I thought I liked and was comfortable with for something new that challenged and expanded my ideas of the world. I find a bit of friction necessary (and welcome) and the thought of a frictionless environment – even if it’s just a career page – has me wondering. Maybe it would be fantastic (and the leap to frictionless is just the “something new” challenging my ideas of the world) or maybe it would be the equivalent of fast food – easy, tasty, and ultimately unsatisfying and a bit nauseating in large doses. For now, I think I’d just prefer the system and process to be easy and simple. Or at least not user hostile. Hi Broc! Thanks for an insightful comment as always! 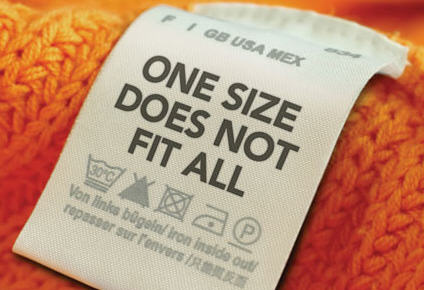 I totally agree, for now i too would take a one size fits all. We are a long way from that basic right for applicants. And it annoys me that on the one hand we champion a vision of “treating the candidate like a customer” yet on the other we single handedly fail at the first hurdle in terms of delivering on the promise. It’s like they have never even experienced their own hiring process. What I want us to avoid is the trend towards pizazz, brand and just jazzing up the experience – or simply the veneer at the front end of the experience – with ‘multimedia’ which is what i am seeing. Its a step, yes, but its not thinking deep enough. You want to create a better experience? Then understand what that experience needs to be. Not what your branding agency thinks it should be. You make a very interesting point though about pushing against personalisation. I hadn’t considered that. Pushing people out of their comfort zone and presenting something that challenged their thinking. Presenting the unexpected. I like that. But then again, thats a step even further from where im proposing methinks!